The first sentence of his biography pretty much says it all: Heimir Hallgrimsson is an Icelandic football manager and a dentist, currently managing Iceland. Heimir Hallgrimsson (born 10 June 1967) is an Icelandic football manager and a dentist, currently managing Iceland. Coaching the Iceland national side is as big as it gets back there. And yet the manager still is pulling wisdom teeth in his home village of Vestmannaeyjar, aka the Westman Islands — the same archipelago that produced Las Vegas advertising mogul and former U.S. ambassador to Iceland Sig Rogich. Sigmund Arnason Rogich helped George H.W. Bush get elected president over Michael Dukakis. Heimir Hallgrimsson helped the tiny soccer-playing nation of Iceland conquer the enormous soccer-playing nation of England 2-1 in last summer’s European Championships. Vestmannaeyjar can be proud of both native sons. “This is a place of 3,000 population,” Hallgrimsson, 49, said in a meeting room at W Las Vegas after the Iceland delegation had flown seven hours from Reykjavik to Las Vegas via Seattle to be sacrificial jalapeno to Mexico in an international friendly Wednesday night at Sam Boyd Stadium. Mexico won 1-0 in front of a Las Vegas soccer-record crowd of 30,617 green-and-red clad spectators. El Tri brought several World Cup stars. Iceland, which never has qualified for the World Cup, brought none of the players who put a shock defeat, as they say on the other side of the pond, on the Motherland in Nice, France, on June 27 past. All of Iceland’s stars and reserves are in the midst of European club seasons, so Hallgrimsson summoned youth and fringe players to Las Vegas — plenty of umlauts, not much experience — hoping one or two would show enough to warrant a call-up. Even Gudmunder Benediktsson, the former national team player turned broadcaster who went into hysterics whenever Iceland scored during the Euros, stayed home. 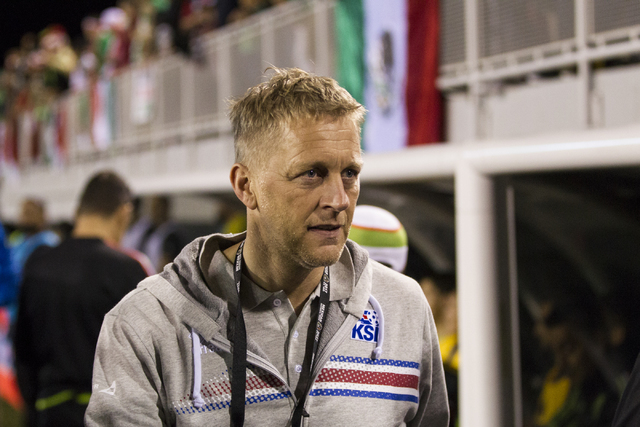 The game against Mexico would be televised in the wee hours of the morning, Hallgrimsson said. But unlike the match against the English lads, when 99.8 percent of televisions in Iceland were tuned in, few probably would watch. Friendlies played in February just don’t resonate, Hallgrimsson said. Should Iceland qualify for its first World Cup in Russia in 2018 — it stands a competitive third in a qualifying group comprised of Croatia, Ukraine, Turkey, Finland and Kosovo — they’ll probably be working the rabbit ears at the Arctic Circle. With a population of 330,000, which isn’t much bigger than that of Henderson, Iceland is the smallest soccer-playing nation to qualify for a major championship. This is a side that was outscored 24-4 in three games in its first attempt to qualify for the World Cup in 1958, and 29-2 in six matches in 1974. When it stunned England before falling to host France in the Euro quarterfinals, people around the globe were imitating the “Icelandic Thunder Clap,” the rhythmic cheer by which all Iceland victories are punctuated, as if it were the Macarena. Iceland used to be known for chess (Bobby Fischer vs. Boris Spassky), summit meetings (Ronald Reagan vs. Mikhail Gorbachev), geothermal pools and a vibrant indie music scene. Now it would be known for something more. “This will be a day we’ll talk about for the rest of our lives,” Hallgrimsson, who was Iceland’s co-manager with Lars Lagerback (who since has moved on to coach Norway’s national team), told thousands of reporters. It is true, he said. If I cared to step into the meeting room, he could prove it by administering a complimentary root planing. OCCUPATION: Iceland national football team manager, practicing dentist. BORN: June 10, 1967, Vestmannaeyjar, Iceland. SOCCER CAREER: Scored 23 goals in 204 appearances for Icelandic senior teams. ICELAND NATIONAL TEAM: Assistant manager, 2011-13; co-manager 2013-16; manager 2016-. DID YOU KNOW? 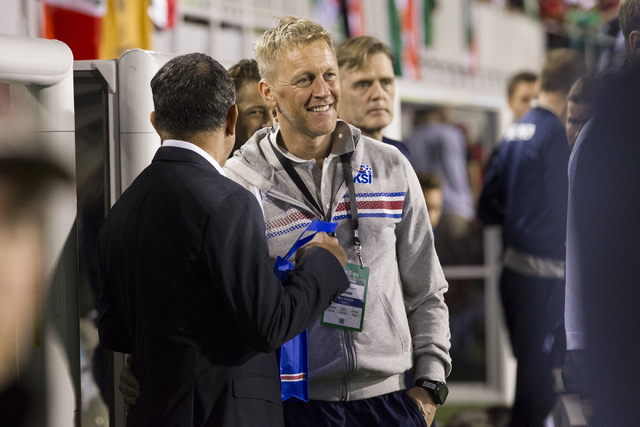 With a record of 4 wins, 1 draw, 2 losses, Hallgrimsson is the only multiple-game manager in Iceland national team history with a winning record.